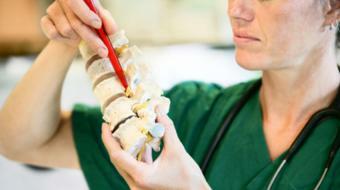 Dr. Beverley Steinhoff, DC, Chiropractor, discusses back pain. Diagnosing the Cause of Lower Back Pain Dr. Beverley Steinhoff, DC, Chiropractor, discusses back pain. Low back pain is probably one of the most common things in a chiropractor's office. Eighty percent of people at some stage of their life have low back pain. It can manifest in various ways. It can be a muscle spasm in your back, it can be a burning, a tingling, a shooting pain. It can be solely in the back or it can actually be combined with some pain that either refers to your gluteal area or your buttocks area. It can refer to your groin or it can refer at various stages down your leg. Because of the very different presentations of low back pain we use a lot that information to determine the causes, and the causes can be varied as well. We look at things like trauma, arthritis, scoliosis, you can have a facet arthrosis or a facet irritation. You can have a disc injury, it can be faulty mechanics or poor gait, various causes. For the most part it is just, you know, some wear and tear disease that sitting, poor postures, or you know you've played rugby too much that weekend, but in the odd and low percentage situation there are a little more sinister causations to your low back pain. And it's very important that the chiropractor can do the proper testing and rule out anything that would be a red flag. When a patient visits a chiropractic office the main thing is for us is to get a clear assessment and a clear picture diagnosis of the low back pain. We require a history, we do an orthopedic and physical examination, we then establish a proper treatment protocol and that can involve many different types of therapy, the major one being spinal manipulative therapy or adjustments. We may use laser therapy, we may use soft tissue therapy such as Active Release Technique or myofascial release. But essentially we're going to do as much as we can during that visit to relieve that patient's pain. X-rays are not always necessary when you visit a chiropractic office but if there is something more serious or there's been a bigger force then the chiropractor may want to have a series of x-rays done. It really is a partnership between the patient and the chiropractor, not only do we provide the treatment that is necessary for the low back pain, but we really are looking to work with the patient in providing them specific and personalized stretches and strengthening exercises. We'll often recommend changes to their workstation or sleeping postures, in some situations people may need some orthotics for their foot or feet. There's various things that we do in tandem to really make the patient take an active role in their patient care. If a patient does have low back pain one of the worst things you can do for yourself is actually sit at home and guess as to what's going to cause it, or the main reason we feel patients stay at home is because they think it's going to go away. One of the best things that you can do for your low back pain is get diagnosed and get diagnosed early, and get the proper treatment early. Chiropractors are experts in low back pain and spinal-related conditions. If you do have low back pain it's very important that you see your chiropractor. If there is a reason that there's something more serious, the chiropractor will refer you out to the necessary practitioner.